General John Campbell, commander of the U.S. forces in Afghanistan, arrives to a Senate Armed Forces Committee hearing on October 6. Top U.S. military officials have already admitted that the deadly air strike on a Médecins Sans Frontières (Doctors Without Borders) hospital in Kunduz, Afghanistan, in October was a “mistake.” It took the lives of 3o doctors and patients. 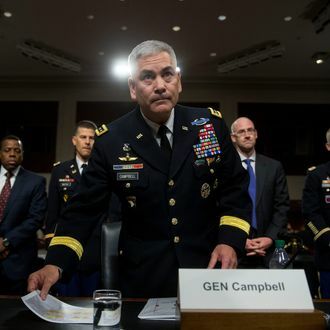 Today, General Joseph Campbell, the top U.S. commander in Afghanistan, revealed the findings in a 3,000-page investigation into the incident, blaming operator error, instrument failure, and a failure of communications between battle-weary forces on the ground and the gunship crew. The report claims that the crew of the AC 130 gunship was called in to strike a nearby government compound, formerly the headquarters for Afghanistan’s intelligence services in Kunduz, which had recently been commandeered by Taliban insurgents. However, the special forces bungled the targeting information, steering the bombs toward the MSF compound, which was nearby. The special-forces commander, according to a source speaking with the Times, was relieved of his command on Wednesday morning. Original accounts given by General Campbell as to how the air strike happened were proven to be inaccurate. MSF has said that staff within the compound frantically attempted to contact U.S. and Afghan commanders during the attack. Furthermore, in the group’s own review of the air strike, multiple staff members reported being intentionally targeted by the gunship while attempting to flee the burning hospital. The air strike has been repeatedly described by MSF and United Nations officials as a potential “war crime.” In addition to President Obama’s direct apology to MSF, the U.S. has offered “condolence payments” to the families of those killed in the strike.